Earth Gear has put together an assortment of beautiful Rustic Bedding that is perfect for anyone looking to put their own design flair into their bedroom. The use of pattern, texture, and color can transform the feel of your room. 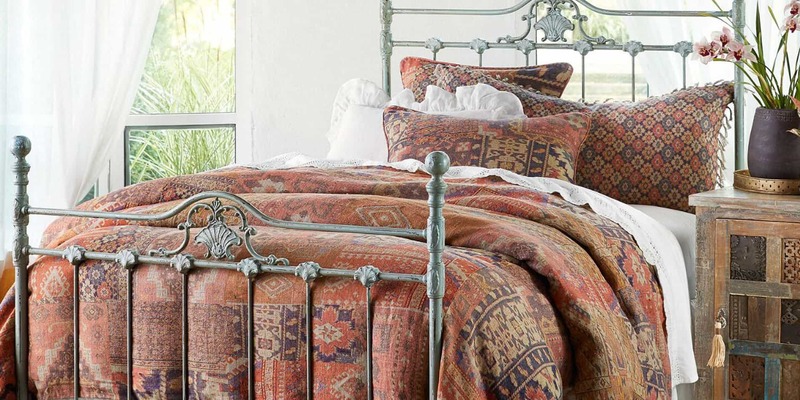 Be bold, be creative and imagine how you can put together your Rustic Bedroom. Who is Sundance? Founded by Robert Redford, the Sundance Group is a diverse collective of non-profit and for-profit entities that share a commitment to independent expression, original thinking and to the natural environment. All items are works of art by local Sundance artisans. Either way up, our floral kantha quilt spreads abundant style. The kantha quilt is bright and light with a vibrant red floral that reverses to solid red. To commemorate the 25th anniversary of their catalog, they designed this updated version of vintage camp blankets. Who better to produce our striped merino wool camp blanket than Faribault Woolen Mills, one of their first catalog resources, operating on the banks of the Cannon River in Minnesota since 1865. The double-weight blanket sports lengthwise stripes on soft, thick gray merino wool with blanket stitch edging. The russet red clays, lush long shadows and flame-tinged sunsets of the Sangre de Cristo Mountains are represented as blocks of vividly abstracted color in our hand-woven, unique cotton quilt. Diagonal and squared-off stitching, micro-striped fabric, all-cotton batting. Quilted by hand and printed on both sides with a lovely patchwork medley of abstract florals and medallions, all in dreamy shades of blue. Kantha stitched. Enjoy the talents of female artisans earning their livelihood in drought-affected areas with this floral kantha quilt. A traditionally kantha-stitch border joins hand-applied cutwork for a cozy feel. The cheery pattern suggests stars, streaming beams of light and dreamy contentment. Designed, cut, sewn and dyed with loving care, this easy-care, luxury duvet cover is of the utmost quality and beauty. Shell button closure. This handmade cotton quilt is a fresh accent in any room with delicate kantha-stitching and pretty florals. Kantha stitched and quilted by hand, a sweep of florals is accented nicely by a striped back.